Learn them in order, in minutes! #1. God is # 1 (hold up one pointer finger). #3. 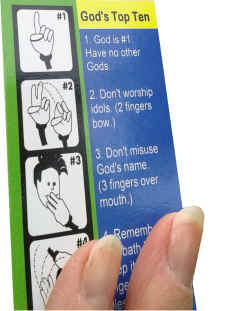 Don't misuse God's name (three fingers over mouth). # 4 - 10 are just as easy to memorize in order! The commands are numbered according to the Hebrew Scriptures. Comes in a packet of ten, 2" x 7" high gloss finish bookmarks. Coordinates well with our other God's Top Ten resources Click here! Bulk orders of 100 or more bookmarks are available; email us for special pricing.